I have to admit I panicked. Late last year, rug canvas was no where to be found in the U.S. The only supplier of wholesale canvas had decided to close their doors and I was in the middle of some new designs. 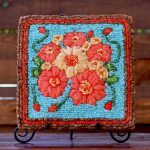 Rug canvas is an essential component for my work and the kits I sell. I couldn’t create without it, so I decided to make the investment and import the best selling canvas in Europe. Well, it has finally arrived and I couldn’t be happier. It is certainly made exceptionally well–so perfectly even. I ordered 100% cotton because I like the natural feel and it’s not as rough as the poly/cotton blend. I ordered two popular sizes-5-Mesh and 3.75 Mesh. They both have blue grid lines for easy pattern designs. Both mesh canvas types are available now at introductory prices on colorcrazy.com. Coming soon to Amazon.com. 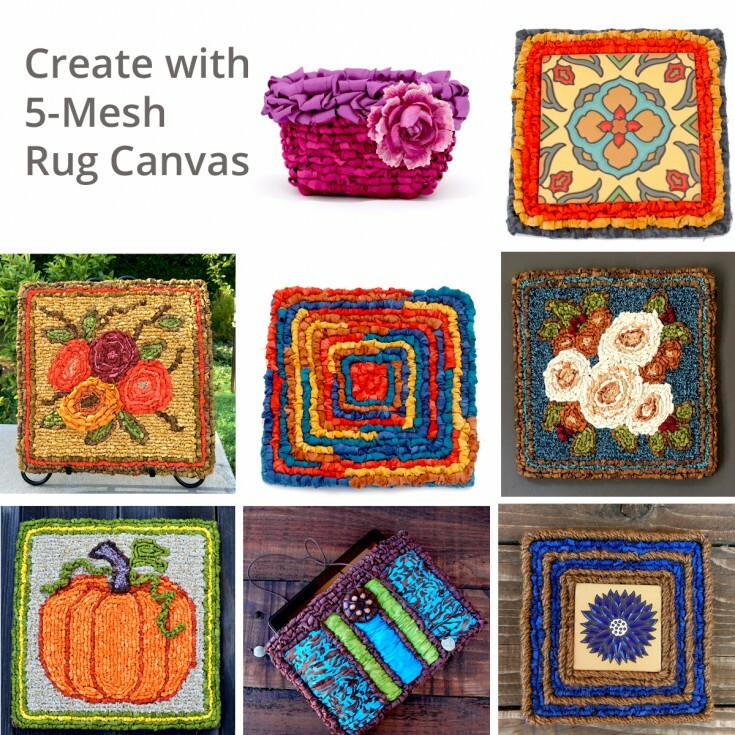 Mesh rug canvas is great for hooking rugs and mats, but you can also hook and stitch baskets, tote bags, bracelets, pillows and decorative wall hangings. To locker hook designs, use fabric strips, yarn and fibers, plastic, or any other material that can be pulled up through the canvas. Color Crazy has pre-cut strips in different fabrics including hand-dyed batiks. If you want to cut or tear your own fabric, the width will always depend on the weight of the fabric. For 3.75 mesh, when cutting cotton, cut strips from 3/4″w – 1 1/2″w. Cut heavier fabrics like flannel and woven fabrics 1/2″w. 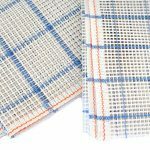 For 5 mesh canvas, cut fabrics 1/2″w – 3/4″w. Wool for 5-Mesh, should be 1/4″w. Again, depending on the weight, if you’re cutting or tearing light silk or cotton voile, you need to cut 1″ – 1 1/2″w strips. Always test the width before cutting all your fabric. 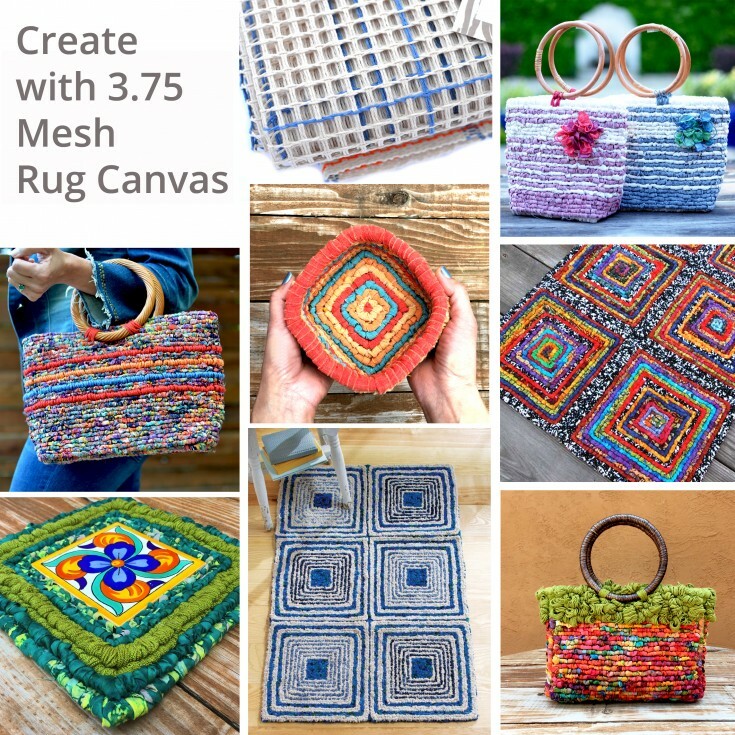 The 3.75 mesh rug canvas is popular for hooking rugs, baskets, and tote bags. These projects are great for sewing fans or quilters that have lots of extra fabric that can be used up or recycled. T-Shirts can be turned into great rugs. I’ve even recycled denim for a rug. The New Color Crazy Rug Canvas has orange border lines and precisely woven squares. They both have a natural cotton color base with the blue grid. 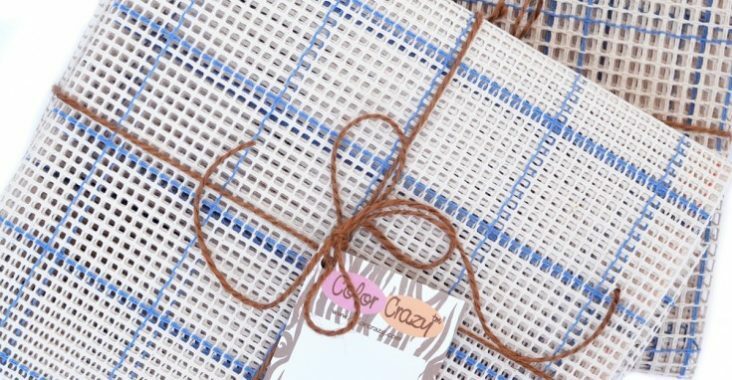 For locker hooking, my current obsession, you can find tools, materials, and free downloadable patterns and video “how-to’s” on colorcrazy.com. Colorcrazy.com carries a variety of tools, supplies and books for locker hooking. 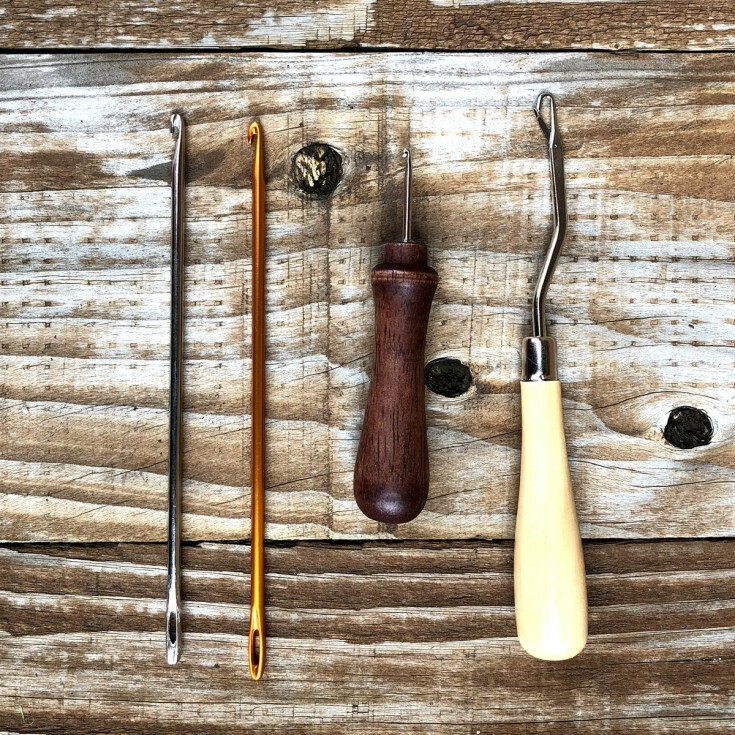 You can find traditional rug hooking and latch hooking tools, scissors and how-to books on Amazon.com. Tools: Locker hook in metal and aluminum, rug hook, and latch hook. 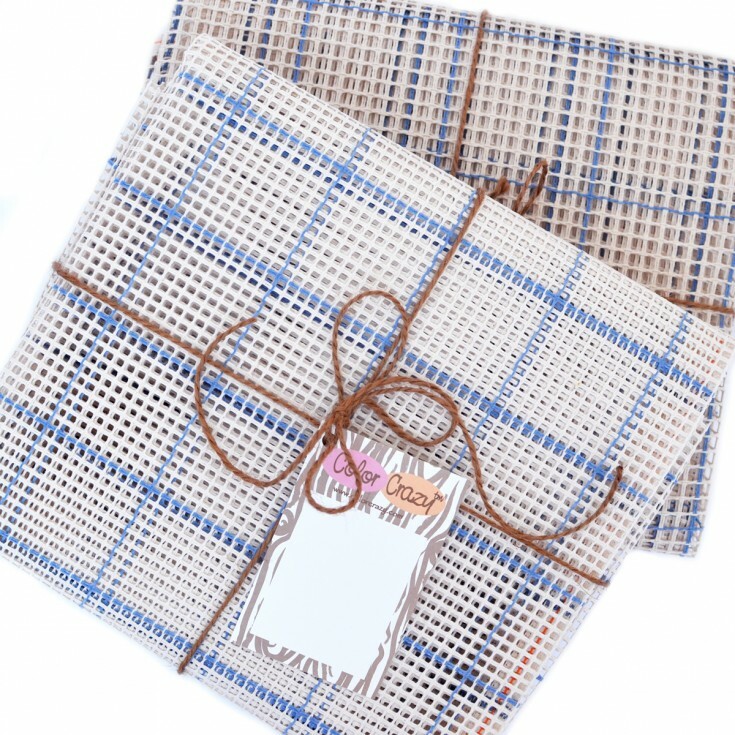 The 5-Mesh canvas offers 5 squares per inch for more detailed designs or smaller projects. 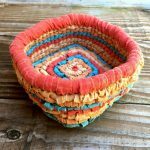 It’s great for mats, coasters, baskets, journal covers, totes, small bags, and pillows. 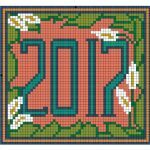 Use 5-Mesh canvas to monogram designs or locker hook and stitch a variety of details. Try recycled silk. Combine yarn and fabric for more texture. Create layered textures with twine or ribbon accents. There is so much to create with this rug canvas. I’m happy to be back at designing new kits, free patterns, and creating more videos. This new canvas is sure to inspire lovers of color and texture to give this fun craft a try.